Getting Speechie with a Good Book! Sheep in a Jeep! This weeks featured book companion is from Tracy Morlan of Gold Country SLP. 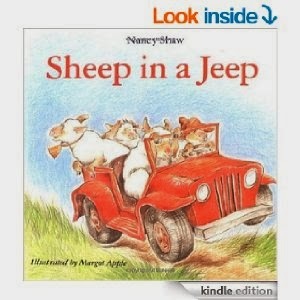 The book is Sheep in a Jeep! by Nancy Shaw. This book companion is great because Tracy includes CCSS citations for each activity, and even gives you some IEP goals that could align with each activity. Story Sequencing Cards- These are cute pictures that can be used to retell the story, or sequence parts of the story. Story Comprehension Questions- The questions are all yes/no questions relating to the story. There are twelve question cards in this activity. Auditory Discrimination of CVC words- This is a list of words that you can read to students. Students decide whether or not the two words rhyme. Phonemic Awareness Activity- Rhyming- This is a simple board where students point to the words that rhyme with sheep. I included the words from the articulation activity with this picture, because I think they would be a great way to target rhyme too. Phonemic Awareness Activity- Phoneme Manipulation- This activity targets changing one sound in a word to make a new word. This activity is really hard for my students to do, so any practice with this is good. There are twelve cards for this activity. Phonemic Awareness Activity- Onset/Rime Blending- Students blend the onset and rime to create a word. There are eight cards for this activity. Articulation of final /p/ cards: There are eight cards that target final /p/. I included these cards in the rhyming activity picture. Semantics- Basic Spatial Concept Words- There are eight cards that can be used to target above, below, beside, in front of, behind, and next to. This packet is nice because it gives you goals and CCSS citations to reference. 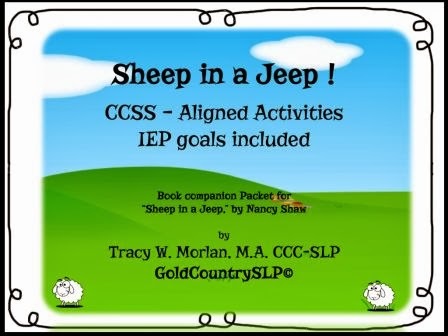 I used the phonological awareness activities in conjunction with my own Sheep in a Jeep! phonological awareness book companion activities this week with my kindergarten intervention group. 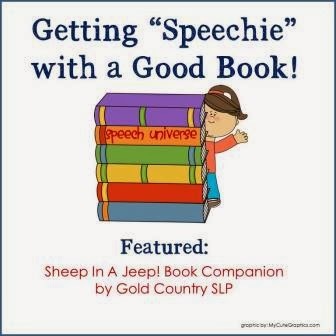 You can find Gold Country SLP's book companion for Sheep in a Jeep! HERE. You can find Gold Country SLP on Facebook HERE. Stop by and say hi!